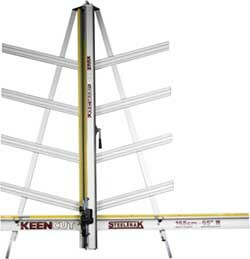 The Keencut SteelTraK vertical cutter cuts even the thickest materials- up to 4mm aluminum composite flawlessly. All cutting tools are permanently mounted on the cutting head. Just turn the wheel and the Utility blade, Acrylic scoring blade, and Composite twin-wheel cutting head is ready.